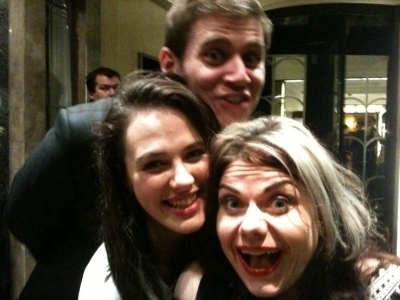 Allen Leech (Branson), Jessica Brown-Findlay (Sybil) and Caitlin Moran. Allen Leech (Branson), Jessica Brown-Findlay (Sybil) and Caitlin Moran. Wallpaper and background images in the Downton Abbey club tagged: allen leech (branson) jessica brown-findlay (sybil) and caitlin moran downton abbey filming. This Downton Abbey photo contains 肖像, 爆头, 特写镜头, 特写, and 爆头特写. Who's that weird looking chick next to Syb?